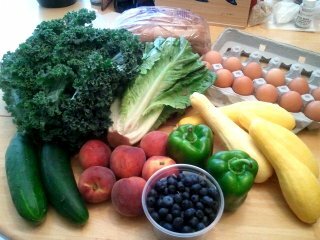 Last week’s CSA pickup at the farm really made me appreciate how hard the staff works to get us our vegetables every week. The farmers and the working shares were sweating it out in the heat and humidity, running back and forth to get our orders, carrying crates of vegetables in the hot sun. Farming is hard work, and so is running a CSA. Kudos to the farmers and the working shares. 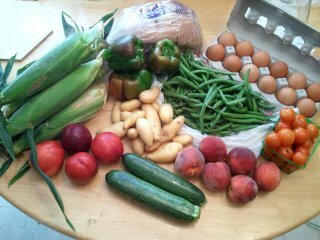 The share consisted of corn (six ears), suntan peppers, green beans, fingerling potatoes, nectarines, zucchini, peaches, cherry tomatoes, and the usual bread and eggs. The peppers went into a meatloaf with some onions, the fingerling potatoes are going to get salt roasted, and the zucchini is likely going to join last week’s yellow squash in a gratin. Pictures forthcoming, maybe. 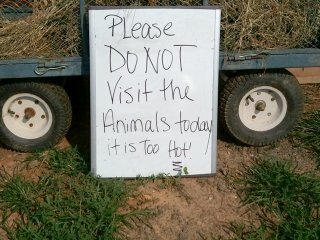 In the meantime, even the farm animals are hiding from the heat. It was very quiet at the farm without their usual ruckus. Look at those gorgeous colors. 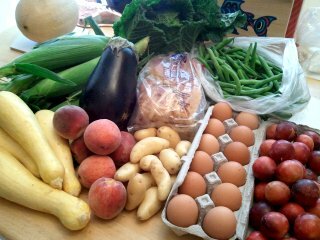 That’s six ears of corn, a Savoy cabbage, an eggplant, green beans, yellow summer squash, peaches, fingerling potatoes, eggs, and a whole lot of little bitty plums. For the bread this week I selected Great Harvest’s Raisin Cinnamon Chip, which, honestly, I didn’t find that good. It’s a bit doughy and dry. Still, toasted, it makes an acceptable breakfast. I’ll just remember not to get it next time. Oh, and I paid extra for that cantaloupe lurking back in the corner. It was very tasty when I first cut into it, but when I went to attack the refrigerated portion the next day, it had turned sour on me. Too ripe, I suppose. Oh well. I love baking, but I don’t do it often in the summer, because a) it’s just two of us here and we’re stuck eating it for a week, and b) the oven makes the house hot. Fortunately, most of the baked goods got eaten and last week was pretty cool. Also, the other girls provided all manner of savory finger foods, tasty salads, and cheese plates. It was a wonderful time. I was full for days. 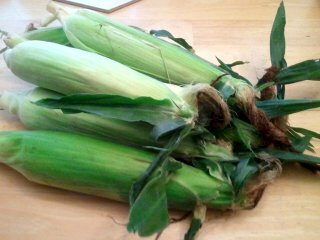 Getting CSA corn is always a bit of a crapshoot because they don’t like it if you peel the leaves back, so you can’t always tell if you have a worm at the top or not. (Worms: the price of organic gardening.) Fortunately the worms only eat a little bit of the corn, so you can just snap off the top inch or two and still have a perfectly good cob left over. Fortunately, this week I didn’t find any worms in the corn, and I was able to make my favorite creamed corn recipe from Thomas Keller’s Ad Hoc at Home cookbook. It’s so savory, with a tang of lime zest and a bit of heat from cayenne pepper. I won’t type it out for you, but it’s really easy, and you can find it at this link. 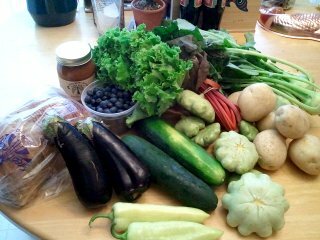 Week 4 of the summer CSA brought a rainbow of produce: red-stemmed chard, yellow banana peppers, pale green pattypan squash and kohlrabi, darker green lettuce and cucumbers, a pint of blueberries, and purple Italian eggplant. Also present: potatoes and whole wheat bread. This was a non-egg week so we got pumpkin butter, which I tried on a piece of toast this morning. It’s fantastic, though it does taste disconcertingly of fall. 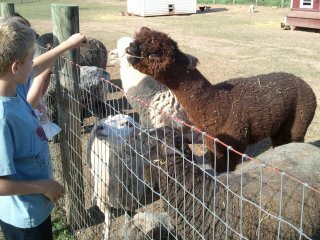 It was another beautiful day at the farm, and the llamas and sheep were crowded at the fence while some young CSA members fed them long pieces of grass. The picture looks serene, with the kid feeding a grass stalk to the llama while the sheep look on hopefully, but it was actually pretty noisy; the air was full of “baa” and “meh” sounds as the animals jockeyed for attention, and the sounds were punctuated occasionally by a crow from the barnyard rooster. Those long-eyelashed llamas are pretty adorable. Nothing exciting to report with what we did with last week’s veggies, alas. The lettuces turned into salad, the zucchini got oven-roasted, I sauteed the beet greens, and we just ate the berries plain or on yogurt. The cucumber, mushrooms, and the actual beets are still sitting in the fridge. Fortunately beets can sit around for a while without too much harm, and although mushrooms look slightly shriveled when they’re older, the flavor is actually stronger. I anticipate doing something cool with this week’s veggies, though. I’ve got enough cucumbers now for another go at my Mom’s cucumber salad, and I’m pondering a chard-and-potato gratin. Also, K makes a terrific beef and eggplant stirfry; if I pay attention, I’ll try to replicate the recipe here.